The Washington Capitals have started to right the ship with three wins in their last four games, after a lengthy skid before the All Star Break. However, what do the underlying numbers tell us about their performance? What’s going well? And where can they improve? 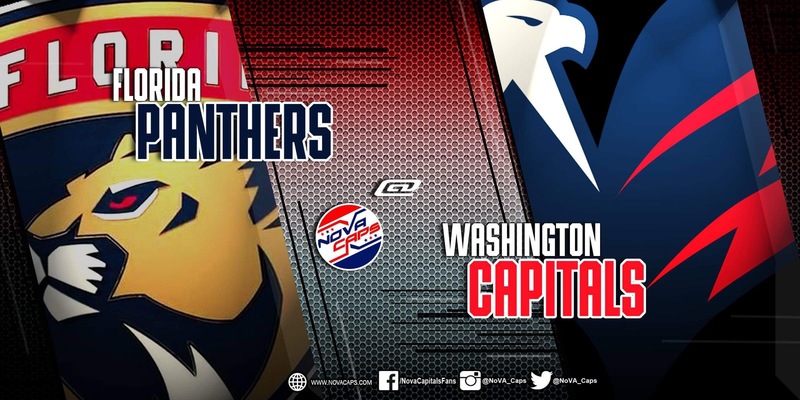 NoVa Caps welcomes Jason Paul from Wave Intel to provide a unique pre-game statistical preview via the new VERSUS comparison tool. 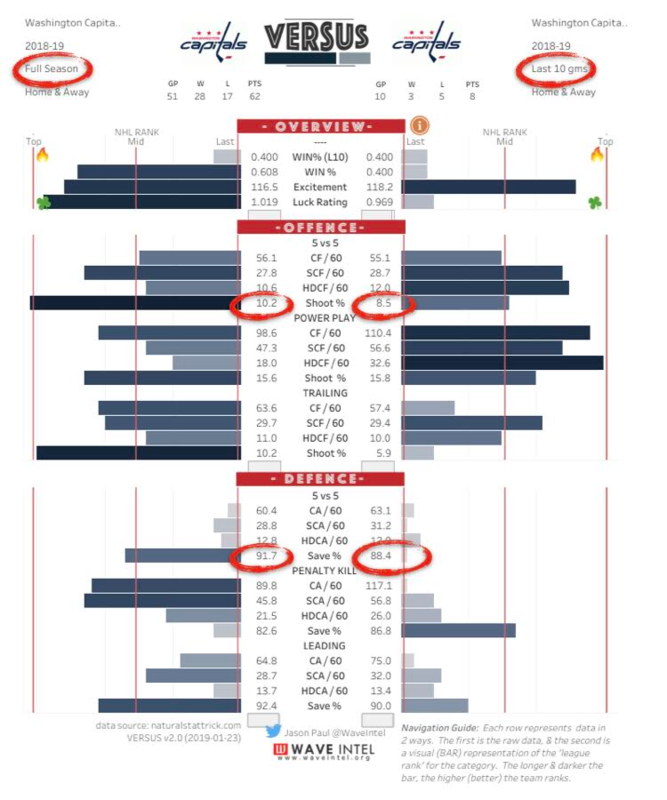 We can start by comparing underlying numbers using the VERSUS comparison tool; comparing season’s totals (on the left side) against the last 10 games (on the right). The longer the bar, the better ranked in the category. Focusing on the offense section first, it is clear the Capitals can generate offense with the best in the league. And that hasn’t’ changed in the last 10 games. However, what has changed is their ability to cash in on those chances. The Caps shooting percentage is way down in the last 10 games. But the defense side of the game doesn’t paint a rosy picture. It has been a season-long issue with the last 10 games, showing a decline in the most precious defensive commodity – save percentage. To make things worse, the Caps ability to defend while leading has deteriorated. The first thing that comes to mind is fatigue. With winning the Cup and all that goes with it. Has it finally caught up to the players? This sag in play also coincides with the time of the year that teams really step up their game. There are no easy wins in the NHL, especially this time of the year. But here’s the really good news. This is pretty much exactly how the Caps underlying numbers looked last year under Barry Trotz. Scary similar. Average offense generation, but superior finish (shooting %). Poor defense (chance suppression), but good save percentage. This is the NHL. In the end, the name of the game is to make the playoffs, get into a groove, and pray to the Hockey Gods. The Caps are a great team. They have already built some cushion in the standings. They have the luxury to breathe and take a few losses, with lots of time to gear up to defend their title. Timing is everything. You can give the VERSUS comparison tool a spin by accessing the tool here. This entry was posted in News and tagged Florida Panthers, Jason Paul, Pre-game analytics, VERSUS comparison tool, Washington Capitals. Bookmark the permalink. As this long home stand is nearing its end what lies ahead for this 2018 – 19 edition. Both offensively and defensively things need to be shored up. For the most part the team is getting good goaltending. Power play and penalty kill need to put it in another gear as we draw closer to the end of the season and into the playoffs. I still believe in adding another scoring forward who can win at the faceoff dot would be a great addition. They are seemingly trying to right the ship but there always a step behind at the moment. A Western swing coming up shortly will give us a better idea in which direction their headed in the Metro Division.